“But it is, above all, by its action on the general nutrition that alcohol weakens. It creates want of appetite, nausea, irregular and insufficient nutrition, indigestion, and consequently a faulty elaboration of the food. In the long run, and in consequence of very complex mechanism, it creates a poor nutrition with all its consequences. Fat­ ness, and sometimes leanness, all sorts of non-assimilations, are the signs which are apparent. The general alteration of the body, the sign of its being out of gear are represented, as we know, by shortening of the length of life and by the early appearance of the decrepitude which signifies old age.”—M. le Docteur Legrain, Senior Physician to the Asylum Ville Everard (Paris). Speech at the International Congress on Alcoholism at Bremen, April 15, 1903. “Concerning the beneficial influence which alcohol is believed to have upon digestion, we must allow considerable room for doubt. The majority of authors who have experimented along this line conclude that even small quantities of alcohol retard gastric digestion, and larger doses cause cessation of digestion.”—Holsti. In view of the great importance of this part of our subject, it is desirable that the student should have some comprehensive conception of what is implied by the term digestion. The digestive canal has been aptly compared to a chemical factory, where the raw material is gradually converted from food­stuffs into completely different substances, which, being absorbed into the blood­stream, are carried thereby to the (protoplasmic) tissues which compose the structure of the body. 144 ALCOHOL AND THE HUMAN BODY chap. Fig. 21.—Diagram of the Alimentary Tract. 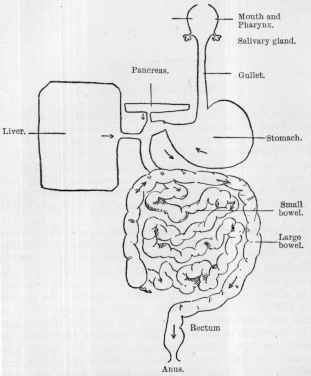 This figure is only a rough diagram to show the relative position of the different parts, namely, the tube (gullet—stomach-bowel), and the glands which pour their secretions into it (salivary—liver—pancreas). The course taken by these secretions and by the food as it passes downwards (becoming digested) is indicated by the small arrows. chambers must of necessity limit the scope of the intricate reactions taking place therein. I. The Mouth, II. The Stomach, III. The Bowels. Their relation to one another and to the various large glands concerned in digestion may be grasped in a moment by study­ ing Fig. 21. The whole tube is lined with mucous membrane, which thus forms a kind of internal skin. It is most important that we should first review in a general manner the characteristics of this tissue, and then study the effects upon such a lining membrane produced by a drug like alcohol. The delicate membrane covering the lips and lining the mouth, and continued from the mouth downwards throughout the stomach and bowel, is so transparent that the pink colour of the under­lying structures, such as the muscles, may be easily recognised. All along its course there lie beneath it tissues rich in blood-vessels and nerves, each of which is affected by anything that irritates the surface of the mucous membrane. This internal skin or lining is far more sensitive to local conditions than the external skin which we described in the last chapter, and is therefore very readily affected by chemical substances. The comparison between the two skins may be brought out by touching them both with moistened mustard. The mustard will lie on the external skin for several minutes before its presence is shown by a sense of heat and tingling : but the same amount placed on the tongue causes an immediate sensation of heat and stinging pain, followed by rapid dilatation of blood-vessels and the formation of a blister or sore, unless the irritant be speedily removed. The first action of any substance placed on the surface of a mucous membrane is naturally upon the very delicate proto­ plasm of the cells, which built up together comprise the surface of the internal skin. 146 ALCOHOL AND THE HUMAN BODY chap. The effect of alcohol upon all protoplasm is to cause it to clot and coagulate. Alcohol produces a cloudiness in the protoplasm, which means that its active living constituents are undergoing the first stage of degeneration. At a later stage the cell shrinks, becomes granular, and is thrown off or shed. When this occurs in the cavity of the stomach it results in patches of the lining membrane becoming more or less denuded of their natural covering. In addition, the mouths of the glands which secrete gastric juice become blocked with this débris of epithelial cells and with mucus, which is secreted in excessive quantities as a direct effect of the presence of alcohol. Those who are wise avoid taking irritants, and thus preserve the delicate structure and the activity of the mucous membrane of the stomach ; whereas those who are careless in this matter become liable to the onset of digestive difficulties, which often first show themselves in feelings of irritability and depression. These failures in the digestive apparatus lead to ill-health and, therefore, to lessened power of work, and, ultimately, to more or less general physical deterioration ; for no one can go on living vigorously with a worn-out digestive system. With regard to children this caution may be emphasised tenfold. If a child’s delicate stomach be irritated, a condition of affairs is soon set up which may throughout life be a source of impaired nutrition, and deprive him of his full share of strength and happiness. Now alcohol essentially belongs to the class of substances known as irritants, its effect depending upon the strength of the solution used. For instance, brandy (which is a mixture of about equal parts of alcohol and water) when dropped into the eye causes intense irritation, pain, and congestion. Moreover, as soon as the inner lining of the mucous membrane loses part of its surface, its blood-vessels are more directly exposed to and acted upon by alcohol or any other irritant ; consequently the congestion is more marked and finally becomes chronic. This destructive process proceeds in varying degrees according to the amount of alcohol taken, and one of the commonest changes produced in the protoplasm of the epithelial cells of the membrane by much smaller doses of irritant chemical substance is that which we shall see very markedly exhibited in the liver, kidney, and other glandular organs—namely, fatty degeneration. A lining cell thus altered is, of course, useless and is rapidly shed. In concluding this general sketch of the changes in the mucous membrane of the alimentary tube when exposed to contact with alcohol, it ought to be mentioned that the cells covering the surface have a definite physiological function and share in digestion as such, from the commencement of the stomach to the end of the bowel. This function is that of active selective absorption, and probably includes even more complex powers. These all-important cell activities, of course, are abrogated by the persistent application to the protoplasm of the cell of any destructive agent such as alcohol, the injury being (as before stated) parallel to the strength of the solution of alcohol taken. digestion of the starchy matters in the food. 1 Alcohol and the Cardio-Vascular System, by T. K. Munro, M.A., M.D., and J. W. Findlay, M.D. 148 ALCOHOL AND THE HUMAN BODY chap. If brandy or liqueur be retained in the mouth for a short time the mucous membrane becomes white and corrugated, owing to the dehydration and commencing coagulation of the tissue protoplasm. This definite hardening of the internal skin of the mouth is a fact made use of by dentists, who order mouth-washes containing alcohol partly because of its action in this direction. Now although unhealthy gums may sometimes require a hardening treatment, the tongue certainly only suffers if substances be applied to it that thicken or alter its surface in any way, for it is meant to be an organ of great sensitiveness and discrimination with regard to the sense of taste. The nerves of taste are situated just beneath the mucous membrane, and it stands to reason that if this membrane be hardened and thickened, their power of sense perception will be delayed and their finer accuracy impaired. Probably no one who drinks alcohol realises that his sense of taste is being numbed ; he merely enjoys the feeling of relief which comes when he adds a glass of beer to a badly cooked meal. Nevertheless, the ignorance which leads a wife to rely upon dinner-beer as a supplement to careless cooking of this important meal is much to be deplored ; for her husband will return to his work less well nourished, although the partially deadened state of his nerves will prevent him from being aware of the fact at the moment. This is all part of a vicious circle of events, because alcohol produces much more destructive effects upon persons who are badly nourished. It is stated that at some public-houses good tasting beer is given as a first draught ; and then (when this has slightly deadened the delicacy of taste) subsequent glasses are given of an inferior quality, even salt being sometimes added so as to increase the thirst of the buyer. Like any other irritant, alcohol when in the mouth stimulates the nerves, and, by reflex action, causes an extra secretion of saliva. Now this extra flow of saliva due to the action of alcohol is not needful to the economy, because food when taken into the mouth and kept there a reasonable time calls forth a supply of saliva adequate to the purposes of preliminary digestion. With reference to a common statement that alcohol in the mouth causes reflexly a flow of gastric juice in the stomach, it has clearly been proved upon dogs by the latest scientific investigation on digestion 1 that in a very remarkable way the gastric juice is secreted in proportion to the amount of food taken. Alcohol is, therefore, not needed to cause an adequate flow of gastric juice. When alcohol is taken into the mouth increased vascularity results, and chronic irritation is set up in the pharynx (i.e. the back of the throat) of people who habitually drink alcohol. These persons are constantly under the necessity of clearing their throats, to get rid of the tenacious mucus which is secreted in direct response to the irritation of the alcohol. From the mouth the alcohol swallowed passes through the pharynx and gullet to the stomach. The stomach is a large muscular bag, lined with a delicate type of mucous membrane. During a meal the food is driven by each act of swallowing down the gullet into the stomach and collects there. Even while the food is being chewed in the mouth, a fluid, the gastric juice, is by reflex action secreted in the glands of the stomach and its cavity, and this fluid is formed with still greater rapidity when the food actually enters the stomach. If the stomach of a pig be obtained and examined on its interior surface with the aid of a hand lens, tiny openings may 1 Pawlow, The Work of the Digestive Glands, 1902. Fig. 22.—Highly magnified draw­ ing of the tubular glands from the stomach. Copied from Klein and Noble Smith’s Atlas of Histology, by kind permission of Messrs. Smith, Elder, and Co. The cavity of the stomach is the space into which the tubes of the glands open by a common mouth. The cells or corpuscles which secrete the gastric juice are seen to be of two kinds, one globular and staining deeply, the others granular and columnar in shape. Each cor­ puscle or cell has its nucleus which is stained. be seen. These are the mouths of the glands of the stomach which secrete gastric juice. There are about 5,000,000 of these in the stomach of a human being. Fig. 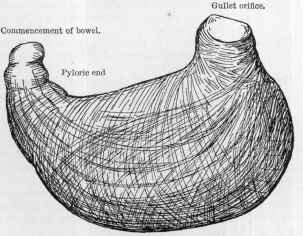 23.—A small sketch of a human stomach which has been separated from the gullet and bowel, and dissected to show the bundles of muscle fibres which envelop it and enable it both to keep up churning movements, and by shortening its long axis drive the food onwards into the bowel. 152 ALCOHOL AND THE HUMAN BODY chap. cord and also indirectly with the brain ; and it is important to remember that anything that depresses these gastric nerves enfeebles the muscular movements of the whole stomach and delays digestion. We may best study this question by considering : Section I. The effect of alcohol on an empty stomach, when taken on rising in the morning, or at irregular times during the day. Section II. The action of alcohol on the food­stuffs them­ selves, and upon the chemical processes of digestion outside the stomach. Section III. The effect of alcohol on the process of digestion, when it is taken at the same time as food. The local action of alcoholic liquids upon an empty stomach is destructive, particularly when taken in the form of spirits or in any strong solution. We have already explained the delicacy of the structure of the lining mucous membrane and the importance of swallowing only such substances as shall not cause irritation or injure this lining to the detriment of the glands. (1) The lining membrane of the stomach becomes bright red owing to the dilatation of blood-vessels, and, because the glands are also stimulated, a needless secretion of gastric juice occurs. This gastric juice is accordingly wasted, inasmuch as no food is taken at the same time to be digested. becomes a source of great discomfort to the sufferer, being accompanied by both nausea and vomiting. The misery and dyspepsia of chronic alcoholics, and of many who only take alcohol in most moderate doses, is directly caused by this condition of gastric catarrh. (3) The mucous membrane from which the epithelial proto­ plasmic cell-lining has been partly lost is further attacked, becomes inflamed, and is ultimately permanently injured in parts. When this final stage occurs the glands cannot act, and the secretion of gastric juice being diminished, the processes of digestion are impaired. (4) Another, and a very important sequence of taking alcohol, is due to its paralysing effect upon the nerve-supply and walls of the blood-vessels of the stomach-wall. The stomach is very richly supplied with blood-vessels, and if these become dilated and engorged with slowly moving blood, a state of commencing local inflammation supervenes. The stomach of a chronic alcoholic shows patches of inflammation which vary in size. In Plate II. may be seen a number of red spots which represent small acutely inflamed patches. These patches often become areas of definite excoriation, and are sometimes as large as a shilling piece, or even larger. Such patches of superficial erosion or ulceration not only directly interfere with the gastric functions, but also form avenues for the easy introduction into the system of microbes, the germs of infectious diseases. The exact condition of the lining membrane of the stomach under the action of alcohol was observed many years ago by a certain Dr. Beaumont. His patient was a man called Alexis St. Martin, who injured himself very seriously by the explosion of a gun. Only after many months did he recover, and even then a hole in the front of his body refused to heal properly. This led into his stomach, and through this hole the condition of that organ could be observed. Dr. Beaumont invited Alexis to become his attendant and to stay with him, on condition that he would allow his stomach to be observed from time to time ; and in this way, for years, careful observations and notes were made. The man was in good health in spite of the opening ; in fact, he married and had children. 154 ALCOHOL AND THE HUMAN BODY chap. “ St. Martin has been drinking ardent spirits pretty freely for eight or ten days past ; complains of no pain, nor shows symptoms of any general indisposition ; says he feels well, and has a good appetite. “August 1, 8 a.m.—Examined stomach before eating anything ; inner membrane morbid ; considerable erythema, and some aphthous patches on the exposed surface ; secretions vitiated. Extracted about half an ounce of gastric juice ; not clear and pure as in health ; quite viscid. We have introduced these quotations in full in order to emphasise the point that there may be considerable damage to the stomach without the patient being aware of the fact. Therefore it is useless for any one to rely entirely on his feelings in this matter, for often it is only later on, when the catarrh becomes permanent, that the misery we have mentioned is felt by the drinker and recognised as a warning, even if he does not attend thereto. they are exposed to the influence of alcohol, even to what is commonly regarded as a trivial degree. Now, each of the minute cells lining the stomach has life and vitality, just as much as an amœba. It has less power of movement than the amœba, but is by no means altogether motionless, being swayed by the currents which pass through its protoplasm, and able to take in and extrude material that surrounds it. It is a cell of the type of the amœba, but highly differentiated (i.e. set apart) for the elaborate work of secreting mucus or gastric juice as the case may be. Considering this likeness, it is a priori likely that it too would be susceptible to the presence of dilute solutions of alcohol in the same way as the cells and unicellular animals described in Chapter III. And this is the case : for the man or woman who repeatedly drinks beer usually suffers from a chronic gastric catarrh, due solely and entirely to the habit of flooding the stomach with weak alcoholic liquids. Moreover, the very fact of introducing beer into the stomach when it contains no food (i.e. between meals) tends to irritate the peptic glands, to upset their method of work, and to render their subsequent secretion imperfect when required for digestive purposes. Thus, indirectly, the digestion of meals is interfered with, for when the hour arrives at which food should be taken, the stomach is already in a state of unrest, and therefore more or less unfitted for its task. All the evidence shows that just as strong solutions of alcohol are more or less rapidly harmful to the digestive organs, so smaller doses are liable ultimately to affect those organs in a slower though similar way—the effects of repeated small doses of any poison having the power of mounting up to a very definite item as the years go by. It is universally admitted that the habit of taking dilute solutions of alcohol on an empty stomach between meals is very bad for the individual. It is therefore harmful to the nation at large. 156 ALCOHOL AND THE HUMAN BODY chap. are required to perform. Whether the alcohol be taken on an empty stomach or with food is immaterial as regards this particular question of muscular activity, because the result is not due to any direct local action of the drug on the stomach wall, but to its influence on the central nervous system, as explained in Chapter V.
It is of the greatest importance, from a digestive point of view, that the vigour and churning power of the muscles of the stomach should be unimpaired. As this vigour depends largely upon the nerves which control the muscles, anything which lowers the working power of these nerves renders the movements of the stomach muscles slow and languid, and delays their full contraction. We have shown that under alcohol the nervous system is not stimulated but depressed, and herein lies the explanation of the enfeebled action of the muscles of the stomach now under consideration. Whether taken alone or with food, the tendency of alcohol throughout is to lessen the vigour of the muscular movements of the stomach, and this delay further tends to lead in the course of time to a state of chronic atony (a-tonus = lack of tone) of that organ. Thousands of men and women suffer unconsciously from this condition of lack of muscular tone in the stomach—due often to overwork and fatigue, but often also to the action of alcohol in causing delayed motility, which delay means that the normal rate of digestion is prolonged. This prolongation leads to further disadvantages, for the stomach is deprived of its needful periods of rest, and hence its power of secreting effective gastric juice is liable to become impaired. Digestion consequently is disturbed, and, as there is no doubt that the products of disturbed digestion exert a very material influence in causing deterioration of our tissues, this is obviously a condition to be avoided if possible. The fact that many delicate persons gradually improve in health when they give up taking alcoholic drinks is to be accounted for by the improvement in their digestion. Their slight gastric catarrh ceases by degrees ; the motor power of their stomach becomes more effective, and consequently their ability to obtain value from their food is increased. “Chronic Dilatation.” In this condition the stomach never contracts fully and effectively so as to expel its contents into the bowel; hence it always contains some remnants of a meal, which ferment and cause “wind.” This in its turn tends to inflate the stomach and itself to increase the dilatation, and thus the “ vicious circle “ goes on. Sometimes a stage is reached in which the distension of the stomach takes place very rapidly and acute dilatation occurs, the patient then being in danger of his life. It is sometimes asserted that the taking of alcohol into the stomach has this advantage, that it is able to exert a kind of disinfectant effect, and it is able to destroy microbes which are the cause of disease. As a matter of fact, it has little influence of this kind in the quantity that can be tolerated in the stomach. 158 ALCOHOL AND THE HUMAN BODY chap. showing that the action on these men is more potent than they imagine (see Chap. XVI.). The numbing effect of alcohol on the brain, and probably also on the nerve-endings in the mucous membrane of the stomach (Chap. V.), is made use of by many to allay the pangs of hunger. Often a hungry washerwoman, whose body really requires proper nourishment, will take stout and then declare that she “feels satisfied.” The poor frequently drink from the desire to obtain the sensation of well-being provided by good food. Having assuaged the feeling of hunger by taking alcohol they conclude, erroneously, that they have consumed what is equivalent to a real meal! This false feel­ ing of “ being satisfied “ is very disastrous to the body—which requires suitable food at proper times, and suffers in the long run if only a sedative (such as stout) be taken. Alcohol appears to have a peculiarly deleterious effect upon the digestion of women. This is explained by the fact that men lead a more outdoor life, and consequently retain their appetite for food longer than do women. For this same reason they are able to work off the effects of drinking more easily, and start afresh the assimilation of food. The indoor life led by most women, and the tight clothing worn round their stomachs, are causes which lead them more readily to be dis­ inclined for food, and when they take to alcohol the earliest effect is to lose their taste for regular meals. As a result of catarrh of the stomach caused by alcohol, an insufficient morning meal (possibly only a cup of tea) is taken instead of a proper breakfast ; consequently, from exhaustion, at 11 o’clock recourse is made to stimulants. After this there is no appetite for dinner, and exhaustion is again felt. More alcohol is taken as night comes on in order to induce sleep, and with the morning there is a recurrence of the feelings of nausea and sickness. The distaste for food to which we have alluded leads to general bodily weakness and inaction, from which the bowels are not exempt. Aperients are resorted to, and a frequent effect of these is to cause feelings of exhaustion and faintness, which lead to the taking of stimulants, especially among women. A firm stand ought to be made against the widespread use of aperient drugs without medical advice, not only on account of the general ill-effects of these medicines, but also since not infrequently their misuse leads to a resort to alcohol. The malady of constipation requires com­ bating on sane and scientific lines. In the early training of children ; in the construction of our school buildings, with a view to the recognition of the fact that health depends largely upon the habit, cultivated in childhood, of daily evacuation of the bowels ; in the relaxation of any hard and fast rules which insist that a child shall be in its place at a certain hour, whether or no this evacuation has taken place , and, lastly, in the avoidance of astringent drinks, and in the frequent use of fruit and oatmeal as articles of diet, lie the correct methods of avoiding constipation and its attendant evils. It is a serious error to regard alcohol as a genuine remedy for dyspepsia and abdominal pain. Feelings of abdominal dis­ comfort and pain (which are physiological warnings to the sufferer that he needs care) are, it is true, abolished by alcohol, and as a consequence of this many a man believes that alcohol materially aids his digestion, whereas it merely exerts a narcotic influence on the gastric nerves, and his dyspepsia is not removed but only disguised. In fact, instead of being cured the mischief is aggravated. This narcotic action of alcohol in covering up symptoms is frequently made use of in many of the preparations on the market which are advertised as “aids to digestion.” In numerous cases, instead of a cure being effected the taste for alcohol is established, to the lasting detriment of the patient. 160 ALCOHOL AND THE HUMAN BODY chap. and preserving agent is well known. If a piece of underdone meat or uncooked white of egg be placed in a mixture of equal parts of alcohol and water (the strength of ordinary brandy), this hardening gradually occurs. Similarly other proteids or albuminous substances when brought into contact with absolute alcohol coagulate into an insoluble material which thenceforth becomes practically useless as a food­stuff. It is, of course, not justifiable to conclude immediately from these facts that alcohol when swallowed has an equivalent power in the stomach of precipitating or altering albumins in food­stuffs, because the period of contact is under these conditions much shorter and the dilution greater. 2 grams beef-fibre + 0·15 per cent HCl + 1 c.c. glycerine-extract of pepsin + varying proportions of proof spirit, brandy, whisky, or gin + water to 100 c.c. Proportion of Proof Spirit, Brandy, Whisky, or Gin con­ tained in the Digestive Mixture. Time in which Digestion was com­ S pleted (Normal, 100 minutes). This series of experiments showed that the presence of alcohol never appeared to accelerate the process of digestion, and that when it was present in the proportion of 10 per cent or more, it caused delay in peptic digestion, increasing with the percentage increase of alcohol present. 1 Sir W. Roberts, M.D., F.R.S., Digestion and Diet, 1891. 1 Digestion and Diet, p. 134. 2 Ibid. p. 137. 162 ALCOHOL AND THE HUMAN BODY chap. 2 grams of dried beef-fibre + 0·15 HCl + 1 c.c. glycerine-extract of pepsin + varying quantities of malt liquors-f-water to 100 c.c. Time in which Digestion was completed (Normal, 100 minutes). 20 ,, . . 40 ,, . . 60 ,, . . Tea and coffee were also proved to retard gastric digestion ; but the author gives no report concerning the effect of those weak infusions of tea which have lately come into vogue and which are little more than hot water. These test-tube experiments do not, of course, represent all the conditions that obtain when food is being digested in the stomach, but they certainly show that when alcoholic liquors are added to a mixture of gastric juice and food material, there is no increase in the rate at which the chemical processes of digestion proceeds. 1 Digestion and Diet, p. 141. The net result of these investigations is certainly to show that all forms of alcoholic beverages seriously retard the chemical process of gastric digestion. juice from rapidly reaching and penetrating the food­stuffs, or (b) nothing to prevent absorption from taking place when the digested material is ready to be taken up and absorbed. movements must be energetic and not slow and feeble. Now the presence of alcohol will either help forward these conditions, or it will hinder them, or it will not influence them in either direction. The question must be examined in these various aspects. 1 The Influence of Alcohol and Alcoholic Beverages on Digestion and Secretion. 164 ALCOHOL AND THE HUMAN BODY chap. are taken is a point to be remembered, as in such event active digestion by the gastric juice is practically abrogated. (b) Many persons resort to alcoholic drinks at mealtimes in order that the flow of gastric juice may be increased. Un­ fortunately, in addition to the moderate increase of secretion of gastric juice, a stimulation of the flow of mucus also occurs, which lies like a slime upon the internal surface of the stomach. This mucus is liable to hinder whatever normal absorption occurs from the stomach walls, and leads, as aforesaid (p. 156), to fermentation and the production of “ wind ” (i.e. gas) in the stomach, by affording a nidus for the growth of sarcinae and other fermentation-producing organisms. 2. In dealing with the second condition of good digestion, i.e. the inadvisability of free dilution of the gastric juice, we would point out that such dilution constantly occurs when draughts of beer are freely taken to “ swill down ” meals. This habit of drinking beer freely with food in no way tends to aid digestive processes. In fact, in addition to the retardation of digestion by the beer, the filling the stomach with considerable quantities of fluid causes distension, and renders more difficult its muscular contraction in a way now to be described. 3. Undoubtedly the great disadvantage of taking alcohol presents itself when we come to consider the churning movements of the stomach upon which digestion so largely depends, for alcohol lessens the vigour of these muscular movements, just as it lessens the force of all muscular activity. We have already described (p. 157) the reason of this delayed motility. Its occurrence has been proved by scientifically planned “test meals,” which have been given to patients with and without alcohol, the results showing that although gastric secretion is admittedly somewhat excited by alcohol, the needful churning movements of the stomach are at the same time so considerably lessened and retarded that the net result works out as prejudicial to digestion. dilatation of the stomach, which arise in part from the badly cooked food they eat, but chiefly owe their origin to the debilitating effect of alcohol upon the muscular walls of this organ and the fermentation of its retained contents. Bitters.—The discussion of the digestive value of alcohol is rendered somewhat complex by the fact that it is frequently taken together with vegetable bitters—hops being the “ bitter ” most often employed. Now the bitter principles of many vegetable drugs are certainly of considerable value when occasion demands ; they tone up a relaxed condition of the system and help the flagging appetite of an invalid or an overtaxed brain worker. Some of them, such as gentian, have few drawbacks, whereas, on the other hand, “hops,” in addition to its bitter properties, contains an ingredient which causes drowsiness, and thus interferes with mental and physical vigour. Those who recognise that even small doses of alcohol are deleterious, can obtain the value of a “ bitter ” by taking it medicinally as a simple infusion, made up with some pleasant flavouring material and without alcohol. Nevertheless, it must be remembered that scientific evidence is not in favour of a constant resort to “bitters” or any artificial gastric stimulants. Recent investigations with regard to digestion, made in Russia during a series of ten years by Professor Pawlow 1 and a number of expert assistants, show that the best stimulus of all to the flow of gastric juice is the condition of normal hunger, which is properly termed a healthy appetite, a more copious and effective secretion of gastric juice being produced than can be obtained by any drug stimulation. A further matter of grave importance to the public is the real nature of the so-called “tonics” and quack proprietary medicines which are very largely sold as nutritious and stimulating, but which notoriously contain quantities of alcohol varying from 5 to 45 per cent. This growing national danger is under investigation at the present time, and it is to be hoped will be combated by adequate Government interference. 1 The Work of the Digestive Glands, by Prof. Pawlow, St. Petersburg. 166 ALCOHOL AND THE HUMAN BODY chap. injurious effect upon digestion of the innumerable common and “made-up” wines that are upon the market is well known. Those containing tannic and other acids are astringent and harmful to the delicate “ internal skin,” and frequently cause constipation and its attendant evils. The gustatory and narcotic effects of wines may give rise to pleasurable sensations, but we believe that pleasures of such a kind will be relinquished by many in proportion as knowledge spreads regarding the close association between alcohol and disease. Reviewing the whole subject of the bearing of alcohol upon digestion, we can only say that the question resolves itself into a question of “ values.” Is it worth while, for the sake of a fleeting pleasure, to take a substance which is continually urging glands to secrete and which delays the operation of digestion ? Above all, can it be worth while to take a drug like alcohol which has ultimately such an injurious influence upon the nervous system, upon the liver, and upon tissue vitality as a whole ? Medicated Wines.—These are concoctions which are pre­ pared both by wine factors and we regret to say by certain manufacturing chemists. They contain considerable quantities of alcohol, and are undoubtedly purchased by many persons because of this fact. But they are also largely purchased by many innocent persons who interpret “bovril” or “iron wine,” etc, in the same metaphorical sense as beef- “ tea ”—namely, as a term denoting a so-called invigorating beverage, and who would certainly refuse to take alcohol if offered to them in a more familiar guise. I. Meat Wines. II. Tonic Wines. 1 B.M.J., “Some Proprietary Dietetic Preparations,” March 27, 1909. “ Tonic ” Wines are also largely advertised and sold. There is generally no sign on the labels to indicate that they contain a considerable amount of alcohol. Yet such is the case. There are many others, some of which are issued under these obscure names which convey no suggestion to the buyer that they are strong enough in alcohol to induce the alcoholic habit. Diet and Dietetics, Robert Hutchinson, M.D.